Ricky Gervais’ new show After Life has proven to be a massive hit, so it is no wonder he is already looking to work on series two. The 57-year-old actor and comedian confirmed the news on Twitter yesterday (March 20), also thanking fans for showing their support. Gervais received universal praise for the show, which follows his character Tony as he struggles to cope with the death of his wife. Once again, I have to thank you from the bottom of my heart for all your amazing tweets about After Life. I’ve never had a reaction like it. I have a spring in my step as I skip towards writing series two. 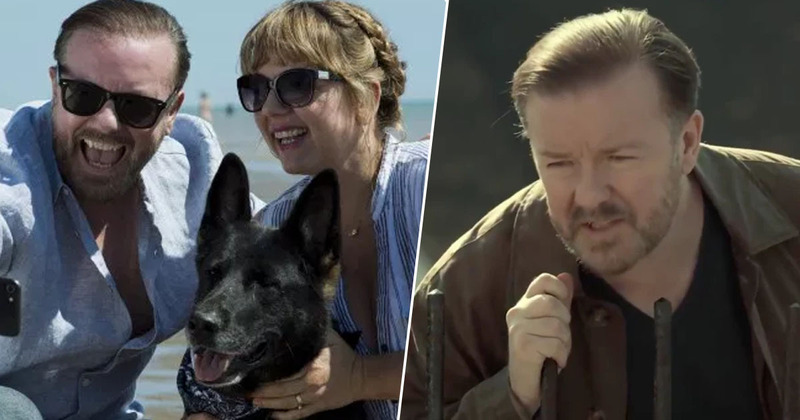 Although Gervais didn’t reveal when he will start writing the next series, the news has delighted fans who are already eager for more. At time of writing (March 21), the tweet has received over 48,300 likes, with fans applauding the Brit in the comments. While the show is a comedy, it is also deeply moving, often offering an honest yet brutal look at grief. Many widowers have congratulated Gervais on this, with WAY Widowed and Young’s Chief Executive Rebecca Cooper telling UNILAD the show is painfully accurate. Last weekend, I was inundated with messages from members of our charity telling me that I must watch After Life on Netflix. I binge watched it all in one go. It was brutally honest, heartbreaking and hilarious – all at the same time. It’s not an easy watch but we hope it will help people to understand the challenges facing people who’ve been widowed young. Member Nathen Amin agrees with Cooper, adding ‘it’s astonishing how well [Gervais has] captured this life’, allowing him to connect with the character of Tony on an emotional level. The way After Life opens up an honest conversation about grief is only one of the reasons it is successful, with Gervais’ performance, the humour and storyline also receiving praise. Hopefully he can deliver the same again with the second series. The first series of After Life is available to stream on Netflix now.